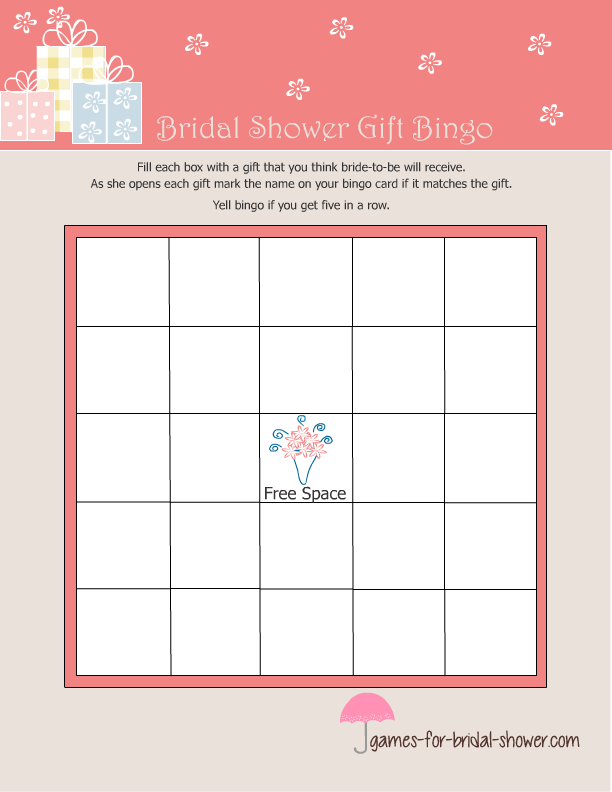 Gift Bingo is another very interesting game that will fill your party with fun, laughter and joy. I have made free printable game cards for Bridal Shower Bingo game in 3 colors so you can choose and print the color that matches your Bridal Shower party theme the most. How to Play: Print the bingo cards according to the number of your Bridal Shower Party guests 1 or 2 days before the bridal shower party. On party distribute the game cards among the guests along with a pen and pencil and ask them to write down the gifts they think bride-to-be will be receiving that day. As the bride will start opening the gifts, ask them to mark the name of the gifts they have written if the name matches the gift that bride-to-be has opened. 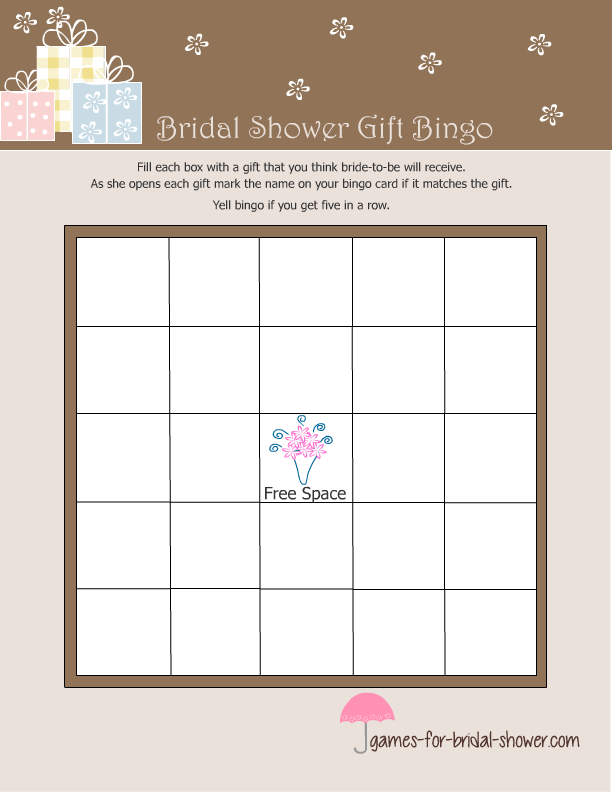 The guest who a complete horizontal, vertical, or diagonal row complete first and shouts the word "BINGO" or "Bride" is the winner. Click on the image above and then right click and save the bigger image to your computer. This bingo game card is beautifully decorated with images of gift boxes and flowers as this is Bridal Shower gift Bingo game. You can choose and print any color for these game cards that you may like. The one one shared above is a classic color combination for this classic bingo game. It will go with any theme that you have selected for your Bridal Shower. Pink is another favorite color for Bridal Shower parties and these game cards in pink color are really adorable. To print these game cards, click on the image above and save the bigger printable version in your computer. If you face any problems, let me know using this contact form.